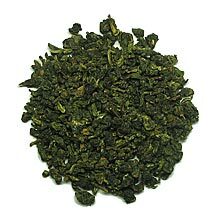 This exquisite Formosa Oolong is also known as Green Oolong due to its lightly fermented state. As with most most Oolongs that originate from Taiwan, you can expect a distinct floral character from this one. In Taiwan, this tea is also called Taiwan No. 13 (a reference to the tea plant species) and is especially loved by the ladies, who prefer light tasting tea. By using about 8-12 grams of tea leaves in a Gaiwan-sized cup, you will get a strong tea with a pleasant floral aftertaste. If you like a lighter tea, you may try using 4-6 grams to brew a light flowery flavored cup of tea. Tightly rolled dark jade colored tea leaves. The infusion is yellowish green in color.